B*Witched were a late 1990s girl group from Dublin, Ireland who were wildly popular in Europe and enjoyed mild success in the United States. They were unique for their ability to mix Irish folk music with mainstream pop. Their members were twin sisters Edele and Keavy Lynch (younger sisters of Boyzone's Shane Lynch), Sin?ad O'Carroll, and Lindsay Armaou (now in band Clayton) Shane Lynch, Edele and Keavy's brother and a member of Boyzone, helped in finding them a manager who got them signed to Glowworm Records, a subsidiary of Epic Records. Shane Lynch, Edele and Keavy's brother and a member of Boyzone, helped in finding them a manager who got them signed to Glowworm Records, a subsidiary of Epic Records. They released their debut single "C'est La Vie" on May 25, 1998. It immediately went No. 1 on the UK charts, making them youngest girl group ever to do so, and also went Top 10 in the United States. Their debut album, B*Witched, was released on October 12, reaching No. 3 in the charts and going triple platinum. Very rare dolls of the group were made by Yaboom Toys. The band deliberately cultivated a tomboy image, with jeans and denim being a trademark of the group. Despite being dismissed as a throw-away pop act, the girls co-wrote many of their own songs, including 5 of their 7 UK singles. 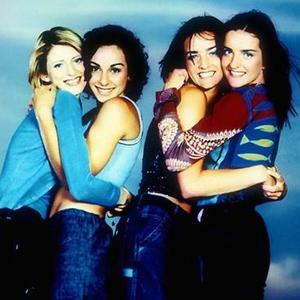 B*Witched was the first group ever to have its first four singles all enter the UK charts at No. 1. This record would later be broken by Westlife in 2000. Their second album, Awake and Breathe, released in 1999, peaked at No. 5 on the charts and only sold a fraction of their debut. The singles from this album reached No. 4, No. 13, and finally No. 16, a disappointment for the group and record company, but the girls continued to tour the globe and began work on their third album with producers Ray "Madman" Hedges and Richard Stannard. "Across America 2000" was released in the US, featuring covers of "Mickey" (which was featured in the teen-flick Bring It On) and "Play That Funky Music", and they re-appeared a few months later on The Princess Diaries movie soundtrack with "Hold On" - a track taken from their third album. Their 8th single, "Where Will You Go", was scheduled for a summer 2002 release, but the group were dropped by their record label whilst shooting the promotional video in Africa. Plans for a new deal with Telstar records fell through later that year, and they officially split in September 2002 after Sin?ad O'Carroll left the band, although Lindsay Armaou has since insisted that all four members remain friends in comments on her official website. Band members Sinead, Edele and Lindsay married in June, July and August 2006 respectively. Lindsay is the only one of the four to begin a solo career as of yet, performing gigs predominantly at the Cobden Club in London, England. Keavy is working on separate projects, including a musical entitled 'Guilty'. In late 2010, Keavy and Edele have now formed a new band, under the name Barbarellas. Their debut single, Body Rock was released on 31 January 2011. It was produced by Yoad Nevo, and remixed by Manhattan Clique and Riffs&Rays. The debut album, Night Mode, was released in April 2011.